Clipper Corporation, a global distributor and supplier for the food service and consumer products industry, will showcase the latest kitchen items from its Viking Culinary collection at this year’s International Home + Housewares Show. Set to hit store shelves later this year, the brand will debut professional-quality products including the all-new Viking 5-Ply Hard Stainless™ Cookware and Tri-Ply Stainless Dual Purpose Covered Roaster & Casserole as well as preview upcoming collections such as Professional Cutlery, Cast Iron Cookware and Stainless Tools & Accessories. The Hard Stainless™ 5-Ply Cookware from Viking Culinary features a durable induction capable anodized exterior with a non-reactive 18/8 surgical-grade stainless interior which both sandwich an aluminum core. 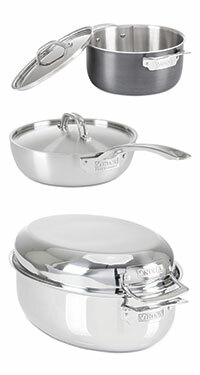 This powerful combination of materials gives the culinary enthusiast the best of many cookware features as the anodized aluminum is extremely durable and heat efficient while the stainless steel is non-reactive and provides an ideal surface for many cooking techniques. In addition, the aluminum core will maximize the heat transfer throughout the pan allowing the home chef to come closer to replicating temperatures used in commercial kitchens. Also debuting at the trade show is the Viking Culinary 9 quart Tri-Ply Stainless Dual Purpose Covered Roaster & Casserole. The construction of this new roaster allows it to be used in a variety of situations, such as a traditional roaster, dutch oven and both a casserole and sauté due to the multi-purpose lid. The large capacity even allows it to be used as a stock pot. The versatile and induction capable oval roaster and lid is made from high-quality stainless steel, making it perfect for cooking on any stovetop. In addition, Viking Culinary will also be previewing its lines of German made Professional Cutlery, Stainless Steel Tools and Cast Iron Cookware which will all be part of the brand’s spring collection. The International Home + Housewares Show will be held from March 7-10, 2015 at the McCormick Place Exhibition Center located at 2301 S. Lake Shore Drive, Chicago 60616. Viking Culinary invites attendees to stop by booth number S4224 to view the new products. For more information on Viking Culinary, please visit www.vikingculinaryproducts.com.